Protect your brand consistency by using one vendor for all print materials. Stay informed on product inventory levels with detailed reporting. We manage your print assets, so you don't have to. Always access the lastest version. WHERE DO YOUR PROBLEMS HAPPEN? Are you constantly responding to requests, issues, and confusion at the store level? 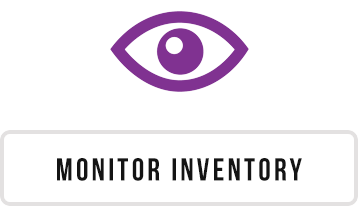 Do you know how much inventory you have in stock from outside vendors? Let us keep your products organized and accounted for with accurate monthly reporting of inventory levels and usage. Do your stores tarnish your brand with inconsistent local printing? We know that quality and consistency is key when is comes to growing your business. Everything we source and manufacture Is done with your brand standards in mind. Are your local store marketing efforts & LTO rollouts difficult to manage? In order to roll out a successful new product or campaign, you must be fast and consistent with your implementation. We are capable of quickly shipping materials to all (or just a small selection) of your stores! Are you spending too much money on shipping and misc. fees? Eliminating multiple vendors will also eliminate separate shipping costs and fees. In many cases, this saves you tens of thousands of dollars annually. Could you use better management & reporting on product inventory levels? We can manage all of this inventory, so you enjoy a single-vendor ordering experience. 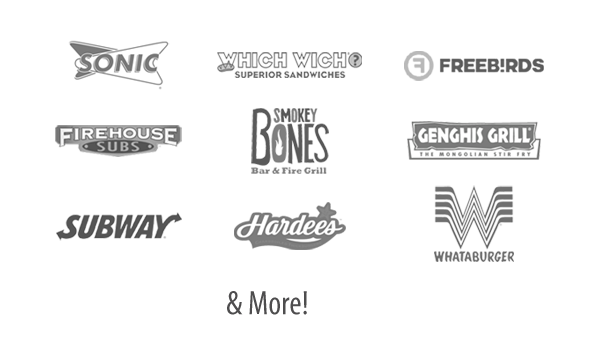 Your stores order what they need, when they need it through your personalized web portal. Do you spend more time purchasing products than marketing for your chain? Don't waste your time (or that shiny marketing degree) on purchasing products! Our team handles everything from getting price quotes and sourcing products, to managing vendors and assuring fast ship times! Are you juggling multiple vendors for items that don't fit in mainline distribution? How can Brand Fulfillment affect your bottom line? Q: Are your local store marketing efforts and LTO Rollouts difficult to manage? A: This is What We Do. In order to roll out a successful new product or campaign, you must be fast and consistent with your implementation. We are capable of quickly shipping materials to all (or just a small selection) of your stores! Q: Are your spending too much money on shipping and misc. fees? A: One-Stop Savings Eliminating multiple vendors will also eliminate separate shipping costs and fees. In many cases, this saves you tens of thousands of dollars annually. Q: Could you use better management and reporting on product inventory levels? A: Stop the Madness! We can manage all of this inventory, so you enjoy a single-vendor ordering experience. Your stores order what they need, when they need it through your personalized web portal. Q: Are you constantly responding to requests, issues, and confusion at the store level? A: Let Our Team Help. Q: Are you juggling multiple vendors for items that don’t fit in mainline distribution? Q: Are your stores tarnishing your brand with inconsistent local printing? 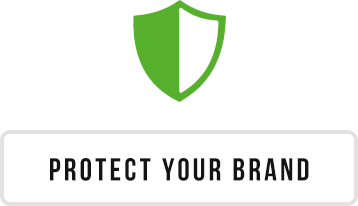 A: Protect Your Brand. We know that quality and consistency is key when is comes to growing your business. Everything we source and manufacture Is done with your brand standards in mind. Q: Do you spend more time purchasing product than marketing for your chain? A: Focus on Growing Your Business. Don't waste your time (or that shiny marketing degree) on purchasing products! Our team handles everything from getting price quotes and sourcing products, to managing vendors and assuring fast ship times! Q: Do you need help managing your print and digital assets? 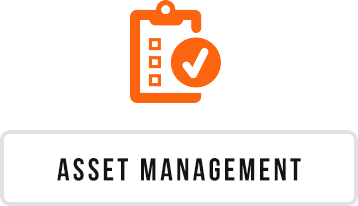 A: Keeping track of assets is a pain. Let us do it for you. Q: How can Brand Fulfillment affect your bottom line? 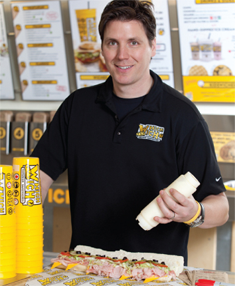 Dot It Restaurant Fulfillment has been instrumental in the growth of Which Wich. 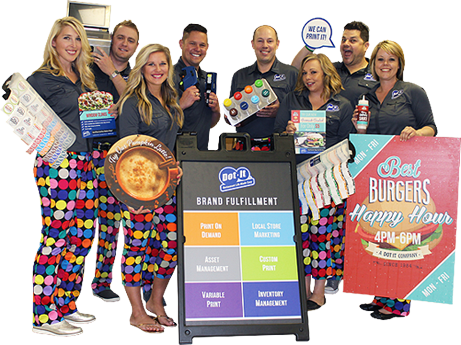 We have partnered up with Dot-It to source and warehouse Restaurant Supplies and Custom Printed items we use regularly that do not fit in our main-line distribution. Their web-based order guide and friendly Customer Service makes ordering easy and quick."